PINNACLE PHYSICAL THERAPY GAVE ME MY LIFE BACK! I fell on the 4th of July, 2018. I immediately knew that I had injured my back, but like many people--hoped it would ‘just go away’. After several days, I knew that wasn’t going to be the case. I called, and got an appointment with an area chiropractor--and she helped--but I was still miserable. On August 3rd I called my doctor again in tears, and they finally gave me an appointment for the following afternoon at 4:30. He prescribed pain killers and sent me on my way. HOWEVER--he did order an MRI and got me a referral to the Axis Spine Center. I will be forever grateful to him for that referral. Dr. Leigh Stevens gave appropriate medications, an epidural and a referral to PINNACLE PHYSICAL THERAPY. By the time Mark Bengtson coordinated my care with Axis, I could barely walk, sit or stand for any length of time. I could only lay on my left side and was still in intense pain. He assigned my case to Collin Zimmerman. He and I designed a plan for my recovery and began the long road back. Looking back, my goals were simple. Be able to walk across the room and sit in chairs again. Collin was patient, caring and willing to take the time to work slowly--but surely towards my recovery. He listened to my concerns and provided the care I needed. One of the things I had mentioned to every medical person I had talked to was the unending pain I had in my right ankle. Everyone--but Collin--considered it just a by product of my fall. But, he took the time to investigate and found a dislocated bone in my right ankle that he worked to return to it’s normal position. He and I felt it had been dislocated for years, possibly decades, and now is pain free and working like it should. I am now able to walk, swim and exercise again. And, I have a normal life. 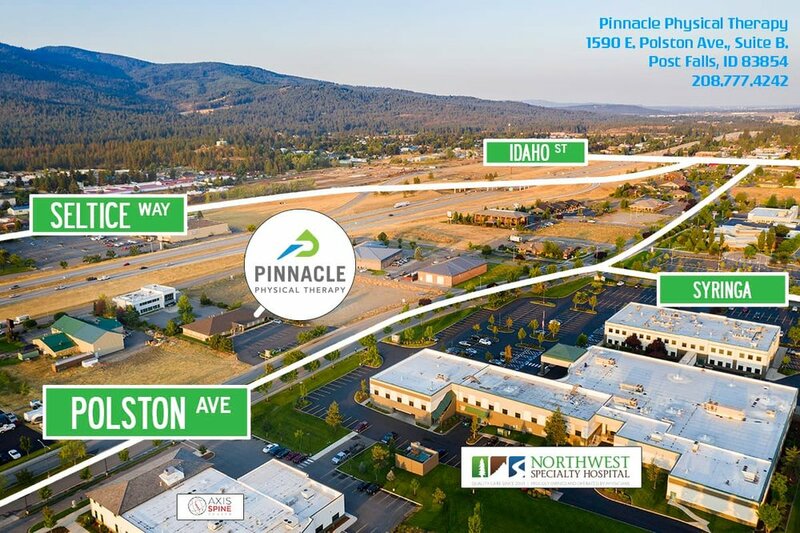 Pinnacle Physical Therapy is far more than a medical office that works on patients. They CARE about the people who come to them for help and make it a point to make all feel comfortable and in good hands. I can’t thank them enough for the care they provided, and I’m sure there are many others that feel the same way. Schedule your free consultation to chat with our doctors 1 on 1 to determine if physical therapy is the right fit for you.